I haven’t really gotten on board with the whole colour-blocking thing yet, I mean sure — if I buy a dress that makes use of the trend, fine… but as for me putting together my own colour-blocked outfits? Well, that’s for someone with better fashion intuition than me. I’m sure there’s a fine line between colour-blocking and colour-clownpants. These soaps from Fred Butler look a bit color-clownpants to me, but we won’t tell him that. I can’t look at these without wanting to lick the screen. 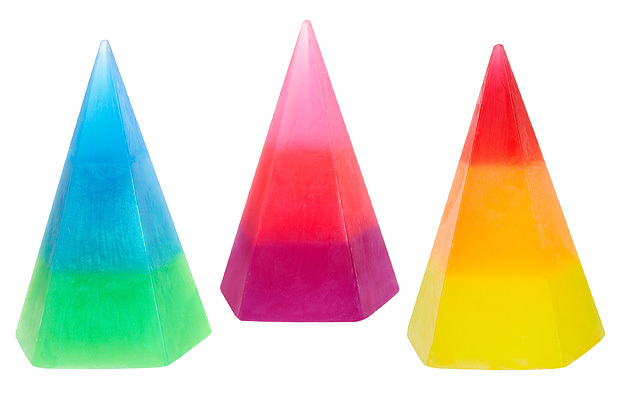 They’re not colour-blocked masterpieces, they’re ZOOM Ice Lolly soaps!! From November, these will be available in three flavours scents: Mojito, Strawberry Daiquiri and Tequila Sunrise – they inject a bit of 1980s summertime into a miserable slide toward a 2011 Winter. Now, where did I park my chopper? Ooh I might get some of these, they look fab! At first I thought they’re candles, I have a candle similar to them in greens. Oh and I love rocket icelollies! Yum! I thought they were candles as well! They look really pretty, but also dangerously shaped for soaps, no? Very nice, and not just the Zoom lollies!